A thin fire is the only light in the long alley, otherwise dark except for a narrow sliver of light shining out of the uneven skirting of Sangita’s rough, shapeless door- it cuts a strange beam across the uneven dirt road or kacchi gali in the light winter mist, resting, diffused, as a narrow strip of color on the blue tin wall of the shack opposite to her’s. I put my camera equipment in her house and join the people at the fire. It is Irshad and Sangita and a few other residents from the same gali– number 7. We are in Ganpatpatil Nagar. My breath fogs in the air. It wasn’t this cold at the site of the Save the Slums Andolan or Movement and hunger-strike in Azad Maidan, where we’re coming from. We’re 40 kilometers north of the Andolan, and still in Mumbai. The mist surprises me as I’ve never seen it before in the city, but it shouldn’t. After all, from a legal point of view, we are in the wilderness and this slum that is home to over 20,000 people is an encroachment that should not exist- a sentiment that shall, in large part, be brought to realization a few hours from now, courtesy of the Bombay Municipal Corporation (BMC) and the fourteen bulldozers and two thousand cops they are sending. The Saint of Slums is working on obtaining a stay order from the BMC; she’s meeting them at 11 AM. The demolition should start at around 9. It’s up to the residents to hold them off for those two hours. It had felt like a war march- us walking from Azad Maidan to Churchgate Station in the middle of the night- I with my equipment, Irshad and the dozen or so Ganpatpatil Nagar residents who had come to the Andolan to apprise the Saint of the situation and seek her help. I don’t remember having ever walked anywhere with the sense of purpose like I had that night. We managed to catch the last train taking us to Dahisar, from where Ganpatpatil Nagar was a twenty-minute ride by autorickshaw. On the train, the residents of the slum began talking and joking and being regular like the mood had changed, or at least evolved, in the whimsical, adaptive way that I was soon to learn is the essence of human nature under the strain of survival. Everyone was nodding off; it was maybe 2AM by the time we got there. Maybe I did too, it was becoming surreal, and I looked at Irshad, who had been sent by the Saint to organize a peaceful resistance and said, “I feel far from the revolution.” He smiled and nodded, “Yes”. Sangita’s shack is large sheets of tin held together by rope and bamboo, and it can barely hold the lot of us. It is Irshad and I, plus those that already sleep here- Sangita, Seema, Sangita’s infant daughter and Ravi. Seema is to be married and sent off to Pune in a few days, but she never leaves and I’d joke about it with her for months. We settle down on the floor and I’m shivering in my leather jacket on the thin jute chatai next to Irshad, who seems impervious to the cold. When I wake up someone has put a couple of sheets on me. It was Ravi, Sangita’s brother, and I’d hear him say as much to someone in a month or so, recounting my ‘humanity’ and ‘sacrifice’ to those present. It’s 6 AM, I assemble my gear and am ready to document the demolition in about 30 seconds. Seema is amused and insists I have tea first; Irshad is already out talking to some of the men- giving instructions and coordinating. “But your homes are about to be destroyed,” I tell Seema, confused. “Yeah, but you can’t get through the day on an empty stomach.” Probably, I can, I think, but I oblige. Soon, the relatively affluent Wakil Bhai will take us to his shack, one of the few solidly constructed structures in the slum, which he runs a cement business out of. He’s had breakfast prepared for us, samosas, and is disappointed when I can’t remember him by face- we must have met earlier in Azad Maidan. Mere hours before the bulldozers arrive, I am being led on a tour of blocks and blocks of shacks and shops running across all the galis (there are 14) that won’t be there come evening. The official word from the BMC is that the slum has been built on designated mangrove area, protected under law from violation of any kind. Ganpatpatil Nagar is something like a 2 kilometer stretch which has the misfortune of lying between a major linking road and a vanishing sprawl of mangroves, although wealthy developers have already built a mall and other, municipality sanctioned pakka structures that the BMC finds no problems with. The land value of Ganpatpatil Nagar would be in the billions by any estimation. They’ve drawn an imaginary line extending 30 feet from the outer edge running along the length of the slum. This will be the demolition zone. Within a month, that line will be extended up to the road, and then there would be no slum. In a year, most of the reclaimed land would be sold off to private builders. At least that was their plan. Sangita steps through the door and automatically, the attendants of a meeting begin to trickle in. As usual, nobody is talking about anything, but I have determined a few things. A new door has been installed, Ravi probably did it, and a beat-up sofa has been moved into Sangita’s house. Any small talk is centered on the technical assemblage of the door. It’s a good door, and everyone’s fascinated. Later that day, a carpenter will come along and put an estimate on fixing the three-seater at ten thousand rupees. It’s the foam and the fabric you see, it’ll have to be replaced, and the woodwork attended to also. He too will applaud the door. Despite the stay order the Saint had obtained, which guaranteed protection for the slum for six months, a small portion is being demolished again. No one appears perturbed and Sangita alone seems preoccupied, her daughter idling on her lap. As per custom, everyone else continues the small talk. There are too many divided loyalties for anyone to speak openly on important developments. I, too, hold back my questions for a more opportune moment. A dark, pretty girl is sitting in a corner, silent. I don’t know her name yet but I’ll photograph her a few weeks later, standing over the tarped up remains of her family’s shack in one of the galis I’m not familiar with (It is bad politics to hang out in the other galis). She will be smiling when I ask her. Her name is Namrita, and all of this is routine. She’ll be okay, she’ll say. A majority of the shacks that were destroyed in last month’s demolition have already been rebuilt, or are in the process of reconstruction depending on the financial situation of the owner. Yes, they are the owners- it takes one and a half lakh rupees for the tin, bamboo and rigging on top of the price they’ve paid for the land plus a three thousand rupee ‘fee’ that local policemen collect on each unauthorized construction in the slum, which is, of course, all of them. Reconstruction has not been possible where the BMC has dug deep trenches as levelling the land is expensive and time consuming work which falls on the individuals residing on those patches rather than on the community like it had at the beginning when the area had been marshes and the first squatters had moved in, tilling the earth and levelling it to a standard before building their shacks upon it- work that would’ve cost millions to any developer that would undertake it, which is why they didn’t, with their interest only wandering in now when a large part of making the land habitable has already been done. A couple of women walk in; Sangita greets them and begins to talk shop. In her ordinary life, Sangita runs a maid service and these women are domestic cooks looking for safe and reliable employment. Of Malvani origin, Sangita is one of the few in the slum who can actually trace her roots to Mumbai. Her parents were fishermen. The meeting, while thoroughly expected, has yet to materialize. Someone’s baby sleeps on the chatai on the floor. Ravi is fixing Sangita’s kid’s bike while the 3-year-old plays in front of the larger of two framed portraits of B.R. Ambedkar, champion of the oppressed lower classes, which hang from the tin walls of the shack. Namrita begins phoning people to get them to the meeting, dialing from a neat handwritten list in a school record book. Beside me, they talk about me. Rumors of my affiliations would float and spar for many months- it became something I took some pleasure in observing, and generally did my part to mislead. It’s how I’d met Irshad, nearly a month ago when I became a part of the Saint’s Andolan. As we wait for the meeting to assemble, the Disgusting Man comes to sit next to me on the sofa, with his lazy eye and utterly repulsive style of conversation. He thinks very highly of Sangita; he thinks of her as a leader. But then he thinks very highly of me too, and thinks I have been sent by God because we had ended up talking once on the steps of a nearby temple, a place he hadn’t been to in fifteen years. He took that as a sign, even though I’d really only asked him if he knew a quiet place we could sit and rest. “I really like you,” he had told me at our first meeting, “if you ever need any help… if you ever need someone beaten up…” His voice had trailed off, and the quick, excited smile that played on his lips whenever he’d have a generous thought faded. “Yeah, I’ve been looking for work these days,” he’d said, the creases on his brow returning until his face was quite lost in the intersecting folds of skin that seemed to lay the geography of his difficult life. Ten days ago, on Republic Day, when the police had sent spies to record the meeting the residents were having with the Saint of Slums, one of them had been captured, for lack of a better word, and held in Sangita’s shack while they figured out who he was. All that time, my equipment and all my records on them were in a dirty messenger bag under Sangita’s television. The Disgusting Man had been the only one to make the connection and had excused himself from the most crucial event in the history of his slum (when the Saint shows up at your slum during a period of sustained demolitions, your slum is not going to be demolished anymore) and joined the lonely captive just to keep an eye on my stuff. “Okay,” I’d said, but I hadn’t believed it. Proof of what? I didn’t even understand half the things that I was recording. The ‘who’ seemed to change every time I asked. The ‘why’ would slip under my feet like treacherous ice every time I tried to figure it out. Whenever I would inch towards an understanding, the entire context would change. Like it had with Sital Deshpande. Deshpande, a Congress corporator who had once risen to power having won the Ganpatpatil Nagar voting bloc, had shown up at gali number 1 on the day of the first demolition, spoken, and left before the bulldozers arrived. I had been deep in the interior, filming the organization of resistance (the same that would break in about 2 seconds once the police swooped in swinging their batons in their signature laathi charge), so I had not seen or heard her. I asked around, what had she said? 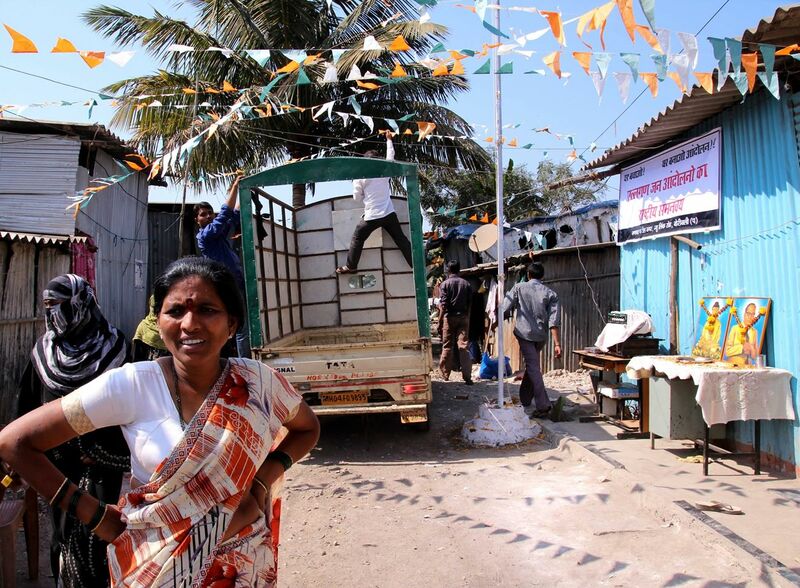 There were two answers- she had protested the demolition of the slum, or, she had spoken to the police official in charge after a personal assessment of the situation and had given the go-ahead for the same. Both seemed to be equally likely actions that would certainly fall under her jurisdiction. A few days after that she had gone on hunger-strike at the nearby police station. Many were angry that I had not gone there to document it. I got a phone call and the voice on the other end was seething. “Don’t you know Sital Deshpande is starving for us, don’t you care? All you want to see is the demolition, nothing else interests you people,” the mysterious caller said and hung up. I asked Ravi about it later and he said that yes, Deshpande did go on a hunger-strike, but she did it to protest the Saint’s stay order, as pausing the demolition midway to confront a contest of legality would probably evolve into talks and compromise, and people like Deshpande, who stand to gain a lot from making arrangements for allotting the slum land for redevelopment would not be able to keep their alleged promises to builders. By 8 PM, the meeting has largely collected- just under 40 people crammed into the little shack, with many watching from the door. Sangita, now the head of the anti-demolition resistance and the chief communicator with the Saint’s camp, lists her good actions which would otherwise not be known. An attendance call of those present begins; nearly everybody is present. Someone raises the point of transparency in the usage of their monetary contributions. She explains how it works and calls for donations. Wakil Bhai is the first to lay down something like a thousand rupees. Sangita tells us that the negotiations for ratification of the slum under the municipal authority rules have already begun. Once Ganpatpatil Nagar is officially declared a slum, its residents will be applicable for various schemes for protection and relocation by the government. When the meeting is over, Sangita waits until most of the attendants have left and then shuts the door, assigning Seema at the door to prevent any intrusion. Inner circle stuff- there are too many dalals or agents of the police, builders and other parties, who, for a pittance, would be happy to sabotage the efforts of the community in getting GP ratified. Sangita produces a map printed on a large sheet like it’s the New Testament and we all huddle around it to get a closer look. It’s an old map of the locality, drawn by the municipal council in the 1980’s, which clearly marks the present day khadi (or slum) area at a sufficient distance from the designated mangroves to satisfy BMC that the slum does not encroach upon the protected marshlands. There is no legal justification for its demolition. I’m walking with Irshad in Ambeywadi, Antop Hill, the slum he works out of. Where Ganpatpatil Nagar is dusty earthen galis and tin shacks, Ambeywadi is concrete rooms and uneven, but paved roads. Some structures here are two or three floors high. They have electric poles with wiring extending to every house and shop. Irshad tell me that the buildings on one side of this street even have plumbing. Very suddenly it strikes me that this is what Ganpatpatil Nagar will look like in 5 years. And in 10 or 15, it probably won’t be much unlike Chembur where I live- quiet, open residential streets intertwined with crowded, narrow commercial alleys, dotted frequently with high rises and public spaces- parks, pools and little squares. This is what I couldn’t grasp in Azad Maidan during the Andolan. I could hear the people complain about their problems, but I didn’t know what they were; I could hear them talk about the future, but I couldn’t imagine what it could be. This is what they were talking about. Mumbai is a dream, the dream, and everybody wants in. Every week, between three and five thousand people flee the poverty of decaying second-tier cities and towns all across India and arrive in Mumbai, each eager for a new beginning and a place of their own. Their hopes are incredible, and infectious, and if I have not caught theirs at least I now know what they look like. Irshad is going to ask me, what changed your opinion of Sangita “I think she has ambitions in politics,” I’ll tell him, like that’s where I draw the line. I remember when I had listened to her, it was late January and a cold, pitch-black night when we huddled around a fire in the gali; it was the night before the Republic day flag hoist, when the Saint would visit the slum for the first time. She had spoken of the struggles her dedicated crew had faced getting to that moment. I knew them, the residents of the slum, and I had seen them- various committees from all the galis of GP uniting under her and organizing against BMC’s blatant land grab. I knew what she was saying was right. When the Saint would come, everything would work out, it was the beginning of the end of an exhausting journey. “I’m not going to change,” she’d said, referring to what she was wearing, something plain and worn- characteristic of her. “I’m going to appear in front of the Saint as myself.” The dancing light of the fire had played shadows across her face, and as she’d sat in silence, I thought I could see the unyielding greatness that must have carried in her blood from ages past, when we fought and died for freedom and dignity, concepts we care little for having once achieved them. In the morning, the door to her shack was shut. I wondered what was going on. She emerged later, wearing a beautiful white sari. “Something very small,” a friend would remark when I related the incident bitterly, smoking imported tobacco in a cushy 7 Bungalow flat some days later, languishing after a stroll on nearby Versova beach. But for whatever reason, I felt betrayed. Remember once you had asked me to detail a profound experience I’d had? I was unwilling to say it then, afraid that meaning would be lost in the semblance of words, and I’d deliver it wrong, or you’d take something from it that wasn’t real, or mine to give. I’ll tell you now though. I think I can. Towards the evening of the 12th of January, the police had largely left, as had the bulldozers that had razed down about a fifth of Ganpatpatil Nagar, a slum near Dahisar and Borivali, home to some 20,000 people. I was moving freely now, without having to remain out of sight from the cops who had harassed me constantly for documenting a historical moment that nobody wanted to remember. My face was dry, it seems; I had been running around from early morning, recording incoherent pleas of protest, outrage and indignation. People were dragging me around to show me how they were living. They knew they had it wrong. This was a revelation to me. They showed me their homes, their temples of worship. They were all in jeopardy. The bulldozers were coming. This was a final recording, after it the subjects would cease to exist and the people would move, but no one knew where. I was in gali number 6, trying to get to number 7 where my base was, and where my leather jacket was (it was cold the night before and it was getting cold again). I was looking for a passage into the adjoining gali when a man stopped me, and asked me the news. I must have told him, I don’t remember, and I don’t remember why he stopped me. He was a magnificent fellow, ugly as a tree in a dirty lungi and an awful, torn vest. He was big and round, dark as ebony and had two copper plated teeth. His voice was like the voice of God. He said I’d been working very hard. He was right, I must’ve been at it for 11 hours, so I took a moment to listen. He asked me to sit down and yelled at a child to bring out a chair for me from one of the shacks. A few other people collected, at a comfortable distance, and they stood perfectly still. The man repeated, “Aaj bahut mehnat ki hai.” He had seen me on my feet since morning. He turned to the crowd and said, his voice rising, “Esne bahut kiya hai hamare liye”. He has done a lot for us today. I’ve heard it said a lot of me now, but it isn’t true, but I never correct it. I have done nothing, been around a lot, but achieved nothing. I don’t know what to do. I waited for the milk and he gave me water first since I had asked for water when he offered me milk, thinking him too poor a man to have him part with milk. I drank- I wasn’t very tired, but I was dried out. The man told me he ran a dairy farm one gali down. The people around us watched, saying nothing. To continue the conversation, out of habit, I gestured east and responded to the acclamation of my effort, “But what good did it do?”, and I let it be as though the words could make it that I could have done something. My voice broke for the first time in years. It doesn’t matter, he replied. He told the others gathered behind him that I had been at my work all day, and no one had offered me water to drink, or a meal. It wasn’t true. He didn’t know it but we had actually broken for a surreal mid-day meal during the demolition, but I said nothing. You can’t argue with the voice of God. A young boy brought out the milk in a steel glass. I nodded politely at the man- the heavy, ridiculous looking man. I wondered if I would ever see him again. I was heavy from the painful, troubling day that was just beginning to end for me. The milk was warm. It was mild and rich and full, with living cream floating in thick strands through the length of the glass. It was the best glass of milk I have ever had.